The Rosen Building was constructed in 1923, and had shops on the ground floor while the first-floor level was originally residential. Four buildings in one area of William Street were constructed within a five-year period in the early 1920s. While they all employ very different architectural styles, they form a cohesive group. Noarlinga Chambers (Nos. 208-212), the Rosen Building (Nos. 218-222) and Taylor’s buildings (Nos. 232-242) now have single businesses operating in two or three of the original shops. In each case, one or more of the original entrances has been removed and a single entrance provided. 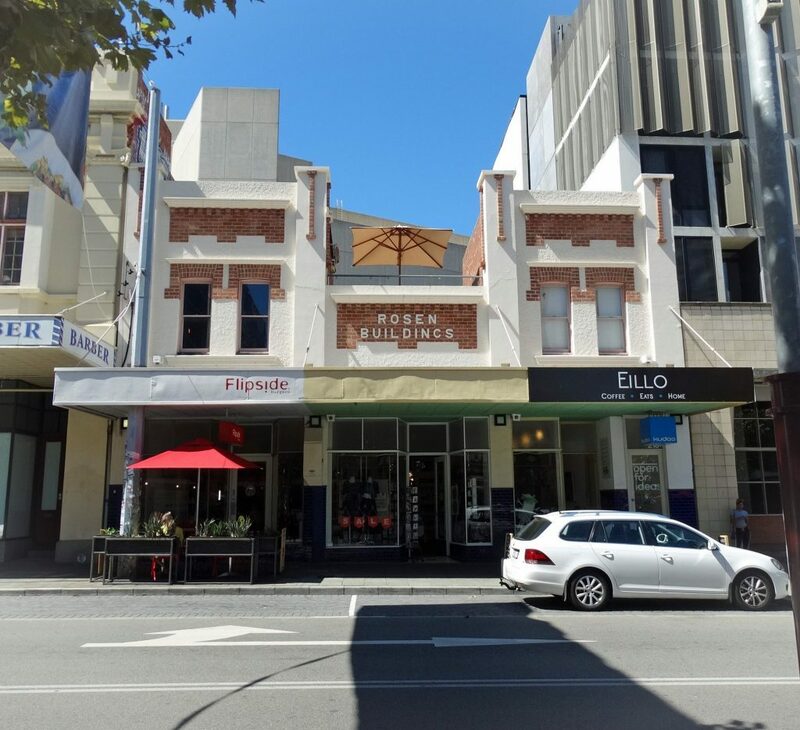 Originally called Hutt Street, the William Street area always had a reputation as a commercial and cultural centre. However, around 1900 the area was better known for its many brothels. It is thought that there were around forty-five houses used as brothels in this area at the time. In 1896 Perth City Council commenced numbering the buildings along Perth’s streets. The idea was instigated by the Post Office and reflects the growing nature of the city. In 1897, Hutt Street was renamed William Street, Lamb Street became Aberdeen Street and Limbo Street became Museum Street. Other streets were renamed to extend the arterial roads. For instance, Howick Street became Hay Street. The construction of the Horseshoe Bridge in 1903 had a major impact on William Street. Although the bridge was unpopular in some circles, it provided a safe overhead crossing of the railway. Opposition to the bridge was principally because it was erected at the expense of the two pedestrian overpasses. The shape of the new bridge meant pedestrians had to walk a great deal further to pass over the railway lines. However, the bridge had a favourable impact on businesses in William Street as there were no more delays at the William Street crossing. William Street underwent massive changes during the late 19th century. In the late 1880s, Hutt Street was on the periphery of the town with few buildings. By the turn of the century, William Street south of Aberdeen Street was a busy commercial district and an arterial road. The mixture of commercial, cultural and ‘immoral’ activities formed William Street’s individual character. The present diverse social, cultural and commercial mix is a continuation of the developments from the beginning of the 20th century.